Super Bowl ads were loaded with hashtags and URLs this year. Companies shouted out a combination of hashtags, social network icons, and URLs in their informational screens or more subtly throughout commercials. 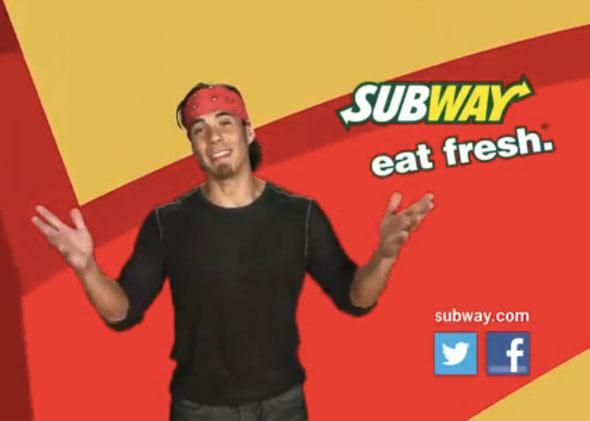 Photo of a Subway Super Bowl ad. When a puppy and a horse are having a cutesy love affair to sell beer, there isn’t always room for the latest tech trends. Of course that didn’t stop 90s advertisers from plastering their masterpieces with AOL keywords. But how far have we come from the days of visiting www.tidedetergent.com on the world wide web or AOL Keyword: laundry? Far, but not that far. Incorporating social media into ad campaigns isn’t exactly a breaking trend anymore. For three years, Marketing Land has been following how many hashtags, URLs, and social network icons are used in Super Bowl commericals for three years, and this year (even more markedly than in 2013) it found that every category is on the rise. Fifty-seven percent of national Super Bowl commercials showed a hashtag, compared with 50 percent in 2013. Facebook had five mentions, and Twitter (the name or the bird logo) had four. Additionally, 41 percent of ads included some type of URL related to the brand or the campaign. Three ads mentioned YouTube and two actually mentioned Shazam, in the form of a little Shazam icon at the bottom of the screen. This seems like a strange way of reinforcing Shazam, since the idea is to rely on it for any music you want to identify, not just music that comes with a visual cue. Perhaps Shazam is trying to remind people who have the app, but don’t think to open it frequently, that their service is always available. Considering tech mentions in national Super Bowl ads may seem trivial, but these commercials are messages that advertisers think will have maximally widespread appeal in the United States. They’re targeted at the largest audience possible and are supposed to resonate with viewers as “Americans.” If companies are giving airtime to their hashtags, URLs, and favorite social sites, they must be relying on these channels as core parts of their brand marketing. At the same time, though, the fact that the number for something like URLs isn’t higher after 10-plus years of brands making websites shows that Web channels may be ubiquitous, but they’re still not the only way to reach Americans.